During the April 2015 Capitol to Capitol lobbying trip, Elk Grove Vice Mayor Steve Ly took to the golf links instead of lobbying on behalf of the city. Those are the findings of an examination of the Ly's 2015 California Form 700 Statement of Economic Interests filed with the Elk Grove City Clerk's office on March 31. Form 700 is a statutory reporting of economic interests of elected officials and key civil servants. According to those documents, Ly, who was a council member at the time, reported that on Monday, April 20, Ly accepted a gift of golf valued at $50 and a $30 dinner from Seng Southathivong, described as a diplomat. According to AllGov.com, Southathivong is Laos' ambassador to the United States. As recently reported on this site, the City of Elk Grove participates in the annual Capitol to Capitol lobbying trip sponsored by the Sacramento Metro Chamber of Commerce. The trip, which typically includes over 300 elected officials, government and business executives, travels to Washington D. C. to lobby Federal officials on behalf of the Sacramento Region. The delegation members are commonly grouped together and tasked with meeting Cabinet officials and Congress Members representing California targeting specific interests such as transportation or education. Most participants of the Cap to Cap arrive on Saturday or Sunday and hold their first meetings with Federal officials on Monday. Social events are usually held in the evening or on the weekend. Although Ly did not disclose how many holes he played with the Ambassador, a typical round of golf is 18 holes and takes about four hours to play. Given that Ly also had dinner with Southathivong, and the travel time to and from the golf course, it appears logistically unlikely that Ly participated in the lobbying efforts that Elk Grove taxpayers paid for. 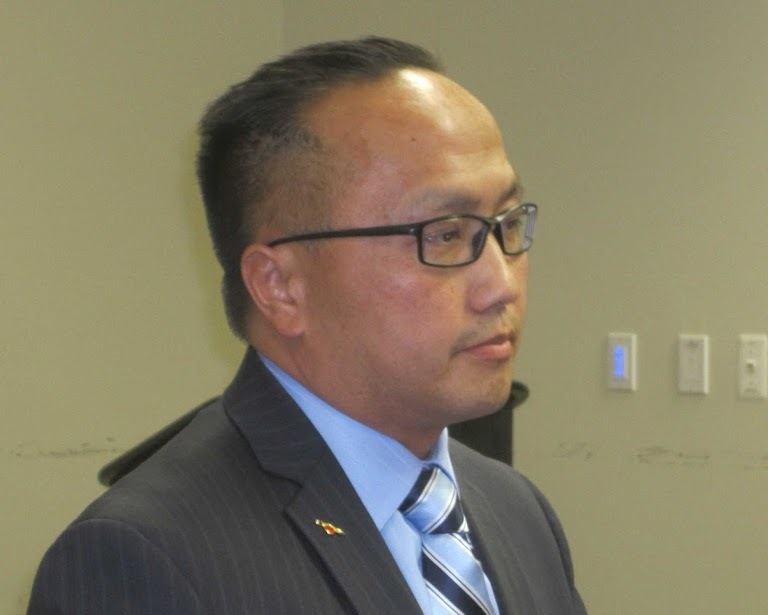 Ly did not respond to an email question asking if there was an economic interest for the people and the City of Elk Grove for him to forgo the meetings with Federal officials and instead spend the day on the links with Southathivong. As a taxpayer of the City of Elk Grove I feel this is a slap in our faces when Vice-Mayor Ly plays golf instead of attending meetings that we paid for him to attend. It's time for Mayor Davis to have a one-on-one with his sidekick. It's obvious Ly needs a lesson in "class" or someone to do some damage control. Maybe he was trying to re-create the famous USO tours that Bob Hope did during the Vietnam War? You know, fly in by jet with a golf club in hand! Mingle a little bit, snap some pictures, crack a few jokes and head back to Elk Grove! This is where transparency is shown to be of great importance. The Cap to Cap meetings play an important role in the marketing of Elk Grove, it's goal being the generation of new business opportunities & investments for the city of Elk Grove & it's residents. Although the results may not be immediate, nor as effective as we wish, it is of great importance to send representatives who handle themselves in a professional manner, are there for the greater benefit of our community, and are not there for their personal gain or personal political networking. The City of Elk Grove is who they should represent & exude 110% of the time when there. If they wish to enjoy sight seeing or leisure activities while there, do it on the days prior to or after the event, on their personal time. These are precious tax dollars that are being invested in this event, and the results and the manner in which you represent us on those hard earned dollars should be held to the highest of standards. Anything less is unacceptable and disrespectful. Yeap! Thats what he did for a community event that he attended. He snap some pictures as "proof" he was there to support but was just there for his personal agenda.